Following on from my 1940s capsule wardrobe list, I thought it might be a nice idea to also put together a version for the 1950s. 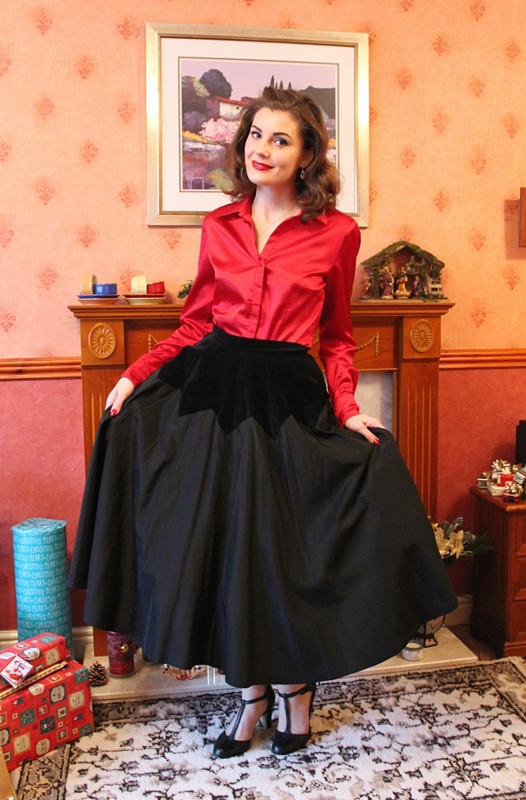 If you're new to dressing in vintage clothing, or just feel like stripping your wardrobe back, here are a few key items you can use to create a 1950s look. Circle skirts are a dream in circle form. Easy to dress up or dress down, and is appropriate for a smarter more mature look as well as a fun teenage vibe. A must for adding volume to circle skirts and 50s dresses. I love the swish that petticoats create and they look great layered up in several different colours. I currently only own several which sadly don't get as much wear as I'd like, but maybe when I have a less practical job I'll be able to include them in my wardrobe a bit more. 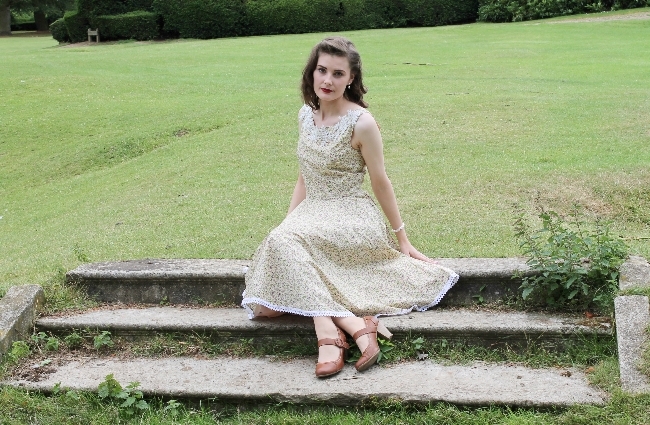 This dress is not an original 1950s dress, but a reproduction one created for me by a dressmaker. However, it just goes to show how easily a 1950s look can be created if you pay attention to details and silhouette of the clothing. 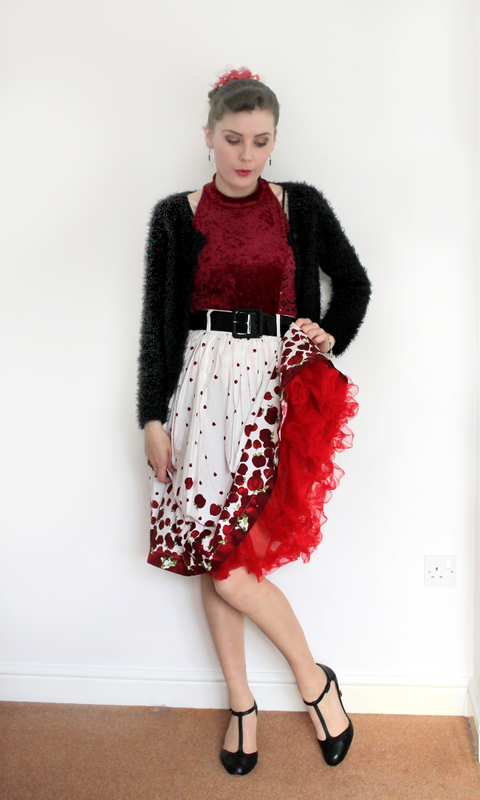 I'm on a big 50s kick at the moment and dresses in this shape are my absolute favourite. I love them with stilettos and a frame bag but they look just as good with saddle shoes and bobby socks. ...Or pants, if you're American. 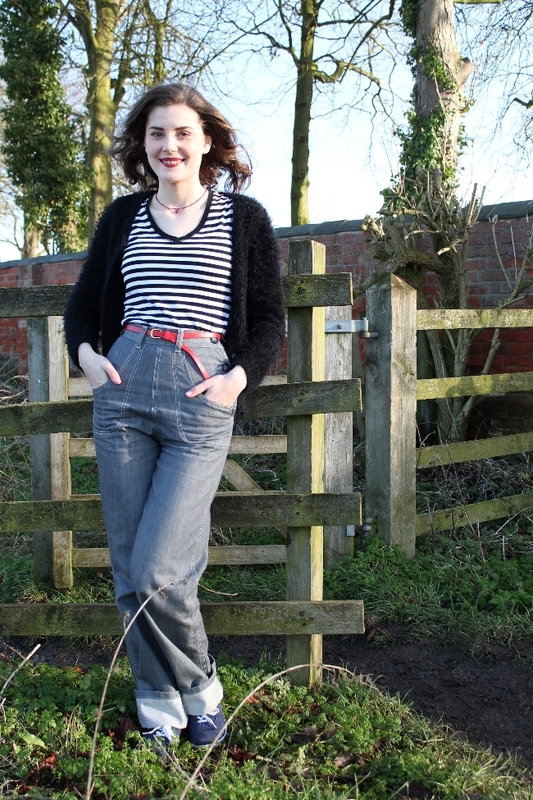 I didn't include any trousers in my 1940s capsule wardrobe, though I could (and possible should) have done. On the other hand, I couldn't bring myself to leave them out of this post as there are a couple of styles of trousers which just scream 50s. My Freddies of Pinewood jeans, for example the pair shown above, are some of my most worn items. You could opt for capris or clamdiggers for a va-va-voom look instead of jeans. These cat-eye sunglasses were permanently attached to my face over the summer until they sadly broke. Cat-eye glasses instantly evoke a 1950s feel, and although I'm not sure I'd wear a pair of them with clear lenses, I've seen plenty of other stylish ladies rocking the look. 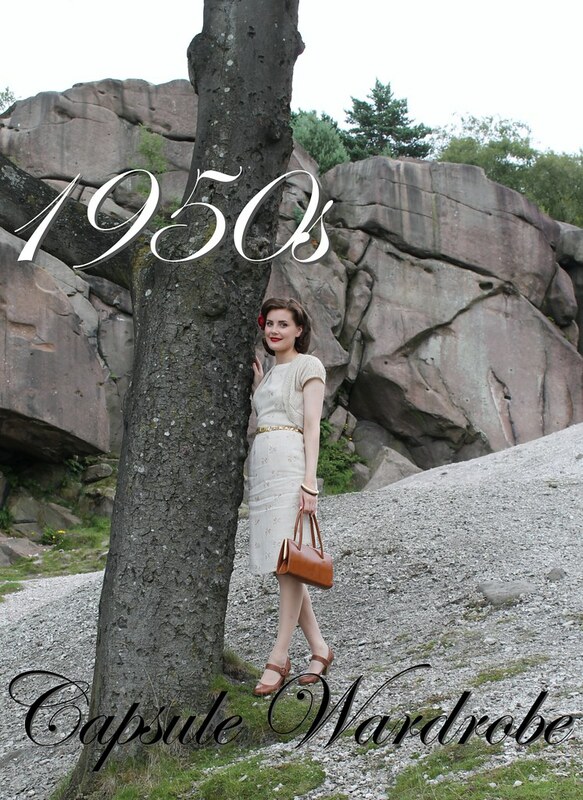 Frame bags such as the one above help to add a 1950s feel to your outfit. I own several in different colours, most of which are from approximately the 1950s-60s. A lucite box purse would be the dream for me, as they're a beautiful classic and highly sought after 1950s accessory. I'd love a pair of lucite heels to match - the ultimate 1950s accessory combo. Saddle shoes and bobby socks could have been included as separate items but may as well be included together. Great with jeans or a circle skirt; personally I do enjoy the slightly costume-y look of saddle shoes and bobby socks with a poodle skirt! I loved your last capsule wardrobe post and this is also fabulous! I really need to get myself a petticoat! Fantastic capsule wardrobe posts! You've got be yearning for some red capri or clam digger pants and a pair of Spring-O-Laters something fierce now this summer!